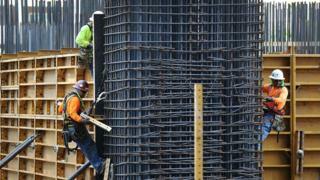 Annual wage growth hit a nine-year high in the US last month as the economy created more jobs than expected. Average hourly earnings rose by 0.4% in August, pushing the annual rate of increase to 2.9% - the fastest pace since June 2009. Hiring in the construction sector and in professional services helped the economy to add 201,000 jobs last month. The strong wage growth is likely to strengthen expectations of another rise in US interest rates later this month. The US Federal Reserve, which has already raised rates twice this year, is due to meet on 25-26 September. The dollar rose in response to the data. The dollar index - which measures the greenback against a group of major currencies - hit a two-day high. This is the raise Americans have long been waiting for. When it comes to the US jobs report, for years now it hasn't been the number of jobs created or the headline unemployment rate that's been in focus, but the mystery of the American paycheck. For nearly a decade, wages here have remained stubbornly unchanged even as the US economy recovered from the 2007-08 financial crisis and the stock market reached new highs. This August jobs report shows that finally some of that good news is trickling down to American workers - even if it creates a possible headache for the Federal Reserve. That's because this long-awaited for raise could mean that prices will be rising here faster than America's central bank had been expecting. That could put pressure on the Fed to raise interest rates faster, just at the exact moment that President Donald Trump has increased his criticisms of the Fed chair, Jay Powell, saying Mr Powell should be doing more to help him. August's job creation figure was higher than July's downwardly revised total of 147,000. The revisions to June and July's figures meant 50,000 fewer jobs were created than previously estimated. The unemployment rate was unchanged at 3.9%. Ian Shepherdson, chief economist at Pantheon Macroeconomics, said: "Wages aren't yet rising fast enough to scare the Fed, but the expectation that further gains are in the pipeline, given the lag from falling unemployment, explains policymakers' intentions to keep hiking. "Unemployment was unchanged in August, but the monthly data are very erratic and the trend is still falling." The figures from the Labor Department showed construction firms hired 23,000 more workers last month, while the professional and business services industries added 53,000 posts. However, the manufacturing sector shed 3,000 jobs - the first fall since July 2017. Video Is roaring US economy a mirage?